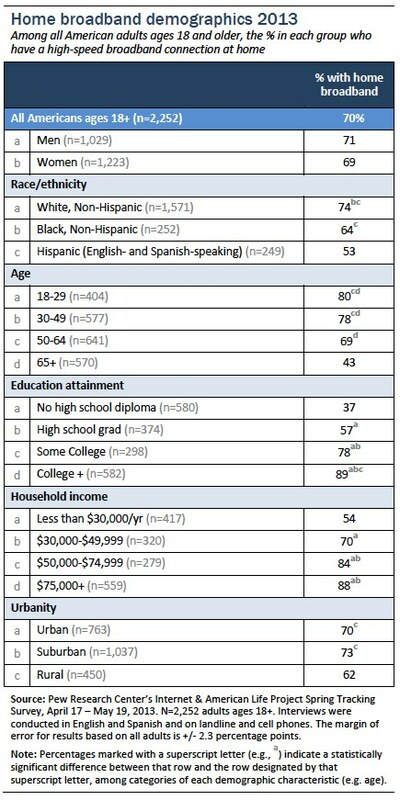 As of May 2013, 70% of American adults ages 18 and older have a high-speed broadband connection at home, according to a nationally representative survey by the Pew Research Center’s Internet & American Life Project. This is a small but statistically significant rise from the 66% of adults who said they had home broadband in April 2012. The demographic factors most correlated with home broadband adoption continue to be educational attainment, age, and household income. Almost nine in ten college graduates have high-speed internet at home, compared with just 37% of adults who have not completed high school. Similarly, adults under age 50 are more likely than older adults to have broadband at home, and those living in households earning at least $50,000 per year are more likely to have home broadband than those at lower income levels. 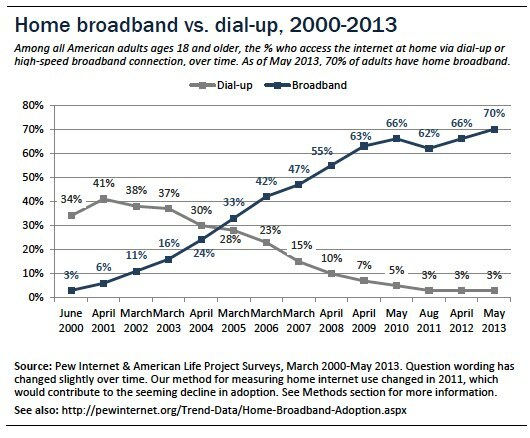 The remaining 20% of Americans have neither a home broadband connection nor a smartphone. 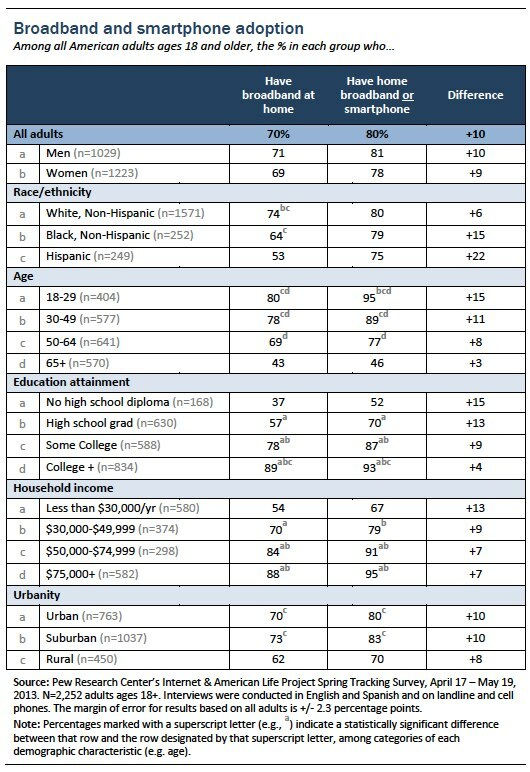 On the other hand, including smartphones in our broadband definition actually exacerbates differences in broadband adoption rates between young and old. Looking just at our standard definition of home broadband adoption, we find that 80% of young adults ages 18-29 have a high-speed broadband at home, compared with 43% of seniors ages 65 and older—a gap of 37 percentage points. If we include smartphone ownership in our definition of home broadband, this gap actually increases to 49 percentage points, because young adults are more likely than seniors to own smartphones as well. Adding smartphone ownership to home broadband use, we see that the proportion of young adults who have ”home broadband” under this definition increases from 80% to 95%, while including smartphones has no discernible impact on access rates for seniors—the 46% of seniors who have broadband or a smartphone is little different from the 43% who have broadband at all.